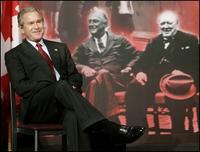 Bush has been haunted by the Ghost of Churchill before he went to Canada. Seriously, though, is there some kind of running bet among the wireservice photographers, whoever discovers the exact shot Scott Sforza has designed for them first, wins a, a what? I have no idea.